Cook the potatoes in a deep pot, when they're ready peel and dice them. Boil the eggs separately and peel. Remove and separate the cooked yolk, chop the egg whites and add to the potatoes. Chop the chives and parsley and add to the potatoes with egg whites. Mix the mayo, mustard, lemon juice, sriracha sauce, egg yolks and salt and pepper in a separate container. Use a fork to mix together all the ingredients. Add this sauce to the potatoes with the rest of the ingredients and use a spoon to mix well. This salad can be enjoyed as a side or main dish. Cook the eggs once they're at room temperature for better results. I love including sauce in my recipes and sriracha sauce has a spectacular taste. Sriracha, for those who don't know, is a spicy Thai sauce made with red pepper paste, vinegar, garlic and spices. Its name comes from the city of Sri Racha located on the coast of Thailand. Sriracha sauce can be used in many dishes and that's why I want to share with you my recipe for a salad inspired by the Southern U.S using Sriracha sauce, potatoes, eggs and chives. 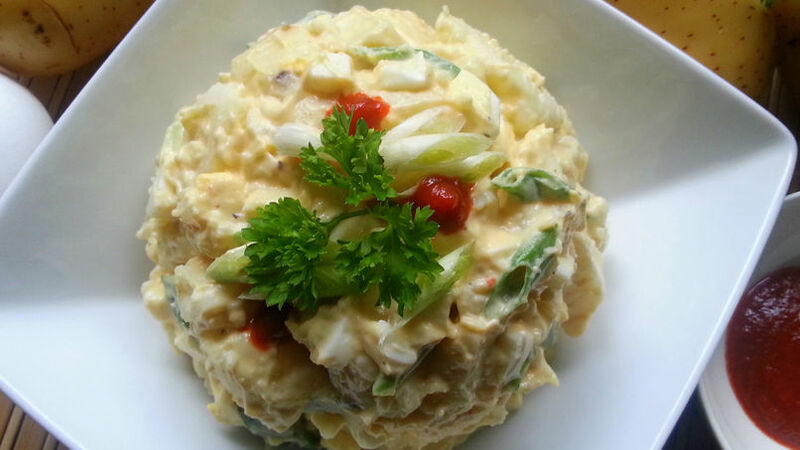 I invite you to try this potato salad recipe with eggs and sriracha. Enjoy!